Hello everyone. 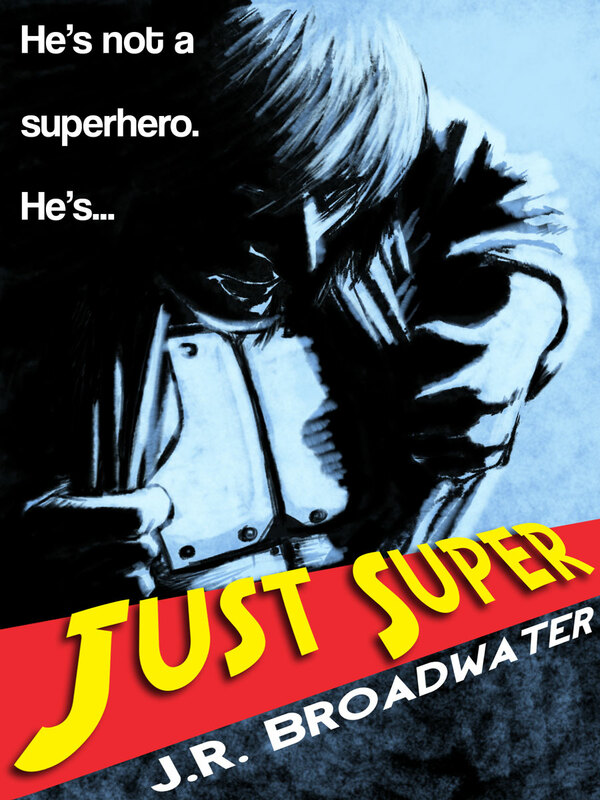 Just thought I’d give you a late Easter treat with another preview chapter from my new novel Just Super, now available for Kindle or in paperback. Hope you enjoy it! I stayed quiet and took a seat on one of the bar stools as Jenn and Keith sat down on the sofa. I took out my trusty little recorder and hit the button as she began to tick off points. “Yeah, we found that out the hard way.” Keith glanced up in my direction but I didn’t detect any malice behind the look. I retired to my little closet of a room and did my best to try and sleep, but memories of a past I thought was long behind me flooded my mind and made that impossible. Instead, I tossed and turned, trying to occupy my mind with other thoughts but always coming back to the same thing: Jenn. I had known as soon as Keith mentioned her name that if I got involved I’d have to face a lot of things I’d tried to bury with time and distance. At the time it had been easy for me to write it off as something that wouldn’t be that big a deal. Then I saw her and that all went out the window. Now it was like I was twenty-three again, before I stepped on that plane and left the best thing I’d ever known behind. Like then, this had all started out about a job, but this time I was going to make the right choice. I made a silent promise that I would do anything I could to help Keith in his mission. Not because I believed in him and what he was trying to do, but because I believed in her and what was important to her. I knew I was being given a second chance and I wasn’t going to pass it up. It wasn’t just a job anymore. I wasn’t just an observer. I’d become a participant. I rolled over and closed my eyes. Sleep claimed me instantly. It took me a few weeks but I was finally able to set up a time when I could meet up with Gimpy and see about a super suit. Richard “Gimpy” Melvin lived in a trailer park out in West Memphis. He was nicknamed Gimpy because of the bum knee he’d acquired running from the cops a few years back. He’d tried to jump a fence, only to discover as he was falling down the other side that there was a ten foot drop which ended in solid concrete. Pop went the weasel. True to the stereotypical image that living in a trailer park brings to mind, Gimpy took pride in dressing like a complete hillbilly: long, dingy hair of an unquantifiable color; scruffy beard; straw cowboy hat; wife-beater complete with unidentifiable stains that had started out in life white but was now closer to grey; blue jeans covered in tears and oil spots with the ends of the legs worn down to strings of cloth, which only accentuated the SpongeBob flip flops he wore. Yep, Gimpy was all class. He was also well connected. In addition to his little black market for military and police surplus, Gimpy ran one of the biggest gambling rings in the south. As such, he was a veritable fountain of information. When you hear the phrase “word on the street,” they’re talking about Gimpy. He’d been an invaluable resource for me in the past, but this trip I was there to tap into his other talents. His “office” was a dilapidated barn that sat on the back of his property. It looked that way on the outside, anyway. On the inside it was like a Best Buy for the militant redneck circuit. The walls and ceiling had been reinforced and gleamed like new, and each section was neatly labeled and displayed. I half expected to hear muzak playing gently in the background. Guns, ammo, combat gear, if Rambo wanted it, he could find it at Gimpy’s. I let out a whistle. I had to admit he did look impressive, like something straight out of an action movie, and if I didn’t know better I’d swear he was the real deal. In the last few years, due to the increase in gang violence and terrorist threats, police gear had been upgraded to improve protection and thus, the life expectancy of the officers. The outfit itself was all black, naturally, though rather than just having a bullet-proof vest all the material was made in a bullet resistant mesh. It was still relatively light-weight and had good mobility, but it’d also stop all but the most persistent debris and shrapnel and most small caliber bullets, even at close range. The vest itself was even more resistant: double reinforced so that even hollow-point bullets, commonly referred to on the streets as “cop killers,” wouldn’t penetrate. The gloves were made of a less resistant but more flexible version of the mesh, and the boots were steel tipped with an anti-slip grip on the bottom. The helmet was the most impressive, however. It was black and domed with a solid visor that not only protected the eyes but the whole face. The visor itself was mirrored, which was a bit disconcerting to anyone looking into it, which I assumed was the point. It was equipped with a H.U.D. that registered targets, helped with navigation, and, though I failed to mention it to Keith just yet, broadcasted a live data stream that was simultaneously recorded to a hard drive. Not all the innovations were for just police protection. Jenn and I would be able to see and hear everything that went on while Keith was in his masked persona.